Have a Time guitar? Submit your pictures here! There's 600 guitars out there. We've got pictures of a few of them. It's rare to find more than 2 or 3 that are identical. So please post. Here's a picture of my three Times. The green one was unfinished (I think in process at the time of the fire). I've got it mostly up, but it still needs some tweaking. Well! Thanks for the post. Please tell us more! 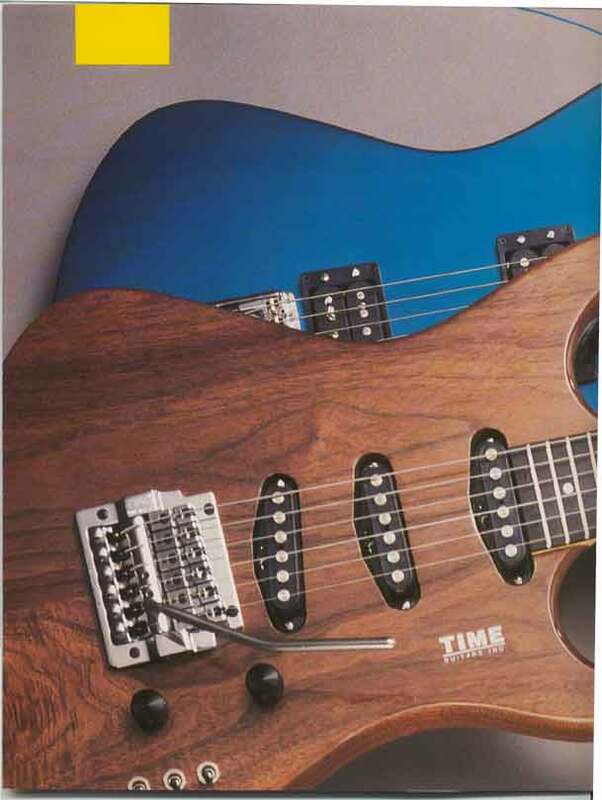 Is the Green Advance Time body made with Alder? Is the Black Walnut Advance from the brochure? What do you remember from your visit to Time for the sale. I had left Time before the sale. Yes, the black walnut time is the one from the brochure (I think) and perhaps the black prime time is as well. I got them about ten years ago through Mark Willis. The green one is one that was unfinished at the time of the fire. I've got it put together and wired up, but it could still use some tweaking, which I'll get to at some point. I have this picture from the brochure. The grain pattern is pretty distintive on this guitar. Notice below the trem here. Thanks for posting the numbers. Your PT-5 #517 is most likely the guitar from the brochure. Cool! It's nice to contribute to the history. Thanks for keeping up the site.